Only 100 captives detained for years by Jaysh al-Islam terror group were released yesterday as per a deal with the Syrian government. With expectation to free up to 5 thousands captives, it turned out that only 200 of them remained alive throughout years of captivity. Sources said that Jaysh al-Islam manipulated the Syrian government and Russian mediators by providing fake lists of the captives with the objective to secure a surrender deal whereby its militants can safely leave their bastion to the country’s north. Thousands of the kidnapped were executed by their captors or died of illness, hunger or fatigue while forced to dig tunnels. 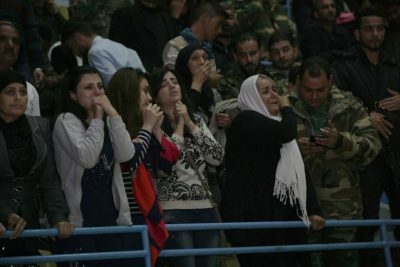 Hundreds of distressed families desperately waited for their kidnapped relatives at al-Fayhaa Stadium in Damascus as the last 2 buses carrying around 100 captives arrived at the overcrowded facility.